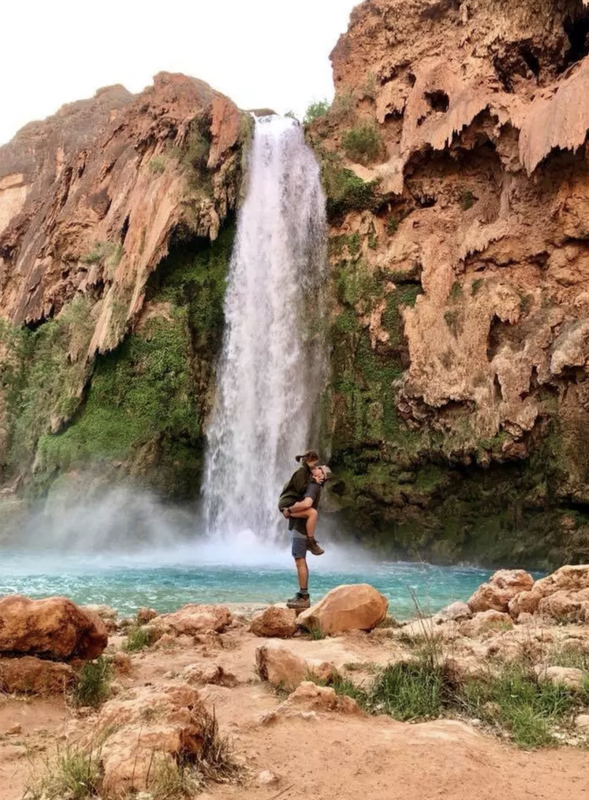 The day I saw those blue-green waterfalls on Pinterest was the day I knew Slade and I had to add Havasupai to our bucket list. Six months later we were heading into the canyon for one of the coolest adventures of our lives! the falls are like nothing else I’ve ever laid my eyes on. If you’re considering the trip, then you already know that, thanks to the internet, there are countless blogs written up that tell you ‘Everything You Need to Know about Havasu’. Google will generate plenty of content on the gear you need, gear you don’t, costs of permits, how to get your permit, directions to the Havasu Hilltop, where the last place is to stop for gas, cost of mules carrying your packs in and out of the canyon, how to find the best camp spots, — you get it! And, this is not one of those blog posts. 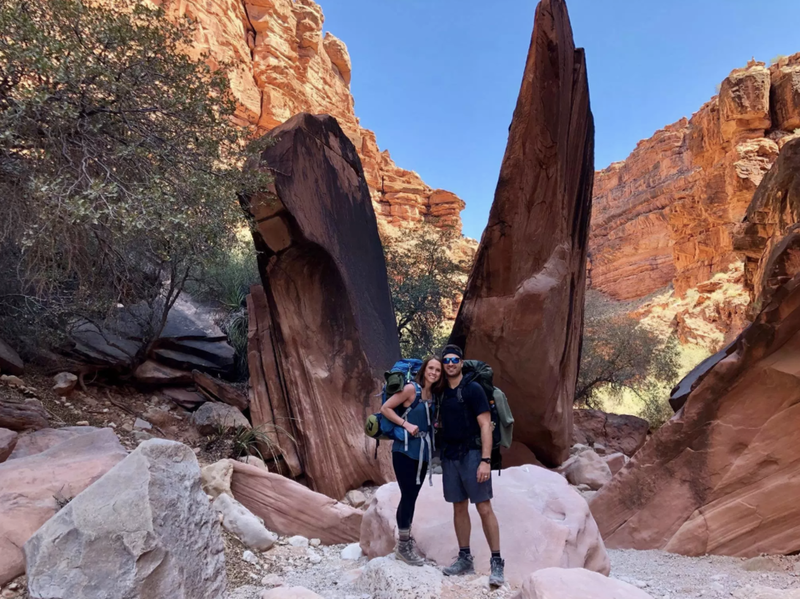 Instead of adding to the internet commotion surrounding everything you need to know about Havasupai, I’ve decided to write something different. The truth of the matter is, the world itself is always changing and updating — so while it is so important to prepare and educate yourself before making this trek, you’ll never fully know until you go. So to cut to the chase: this post contains a little bit of info on what I didn’t know *after hours of research* that I wish I had! Don’t underestimate that last mile. Only carry down the water you’ll need for the first 10 miles of hiking. We read conflicting notes about this from previous campers and decided to play it safe and bring all the water we thought we might need for 2-3 nights. Mistake. Our bags were unnecessarily heavy! At mile 8 you hit the reservation, where you can stop and reload on anything you could possibly need: water, a cheese burger, frozen gatorade, power bars, fruit, candy bars… Seriously, there’s a fully loaded store there! So carry down more cash, less water — it’s much lighter that way. Once you make it to the campground, there is a constant flow of water available to all campers. We did read that you can’t depend on this water source (so *proceed with caution*) but we didn’t have any issues with water. At the start of the mile-long stretch of campsites, there are tiny little huts where you can buy food and drinks from! I think most people like to leave this part out of their adventure blogs to avoid seeming like they weren’t really roughing it. So I say, if you want to truly rough it, keep walking! But know it’s there. Make the hike down. This is an equally breathtaking part of the experience as are the falls. However, had I read accurate information beforehand, we may have considered a helicopter ride back out of the canyon. I hesitate to include that tidbit, because the hike back up to the Havasupai Hilltop will forever rank on my “Top 10 Most Challenging But Equally Rewarding Things Ever” list, but I mean...the helicopter ride out probably would have had some killer views, let’s be real. And for only $80? Worth it. Disclaimer: as of April 2018 (when we camped), the pilot flew all days of the week other than Tuesday and Wednesday. Plan accordingly. And not only are you unable to make this reservation ahead of time, but even after securing your spot in line, you still can’t count on a flight out. If it’s too windy, they’ll call it — no matter what. Moral of the story: even if you plan to fly, know that you might need your hiking boots on the way out anyways. Two nights is the perfect length stay, but of course that falls into the “measly opinions on the internet” category. However, it’s fact that it’s possible to see and do everything in 2 nights. And it’s cheaper that way! When hiking to Beaver and Moony falls, do so is with two pair of shoes. One for water, and one for land. You’ll have to cross over the river multiple times over the course of those 6 miles, and we did this all wrong. I had on hiking boots, and Slade had his Chacos. When we were crossing the river, I was in trouble (well, my husband was in trouble, as he was carrying me), and when we were on land, Slade was jealous of my boots. I saw a man wearing water shoes and a backpack with his boots strapped to the top. He would change between shoes each time he crossed the river. Sounds a little monotonous, I know; but you’re reading for my sound knowledge, right? For more information about trails, pricing, directions and more, I confidently recommend these two sites specifically after having been there myself. And always reach out to me for advice! Happy camping!